For the first time in my adult lifetime, I am really proud of my country. 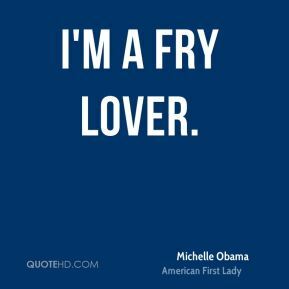 And not just because Barack has done well, but because I think people are hungry for change. 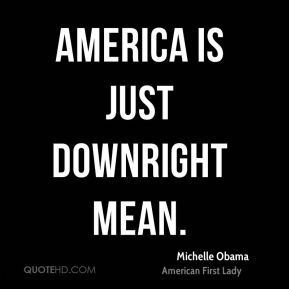 And I have been desperate to see our country moving in that direction. 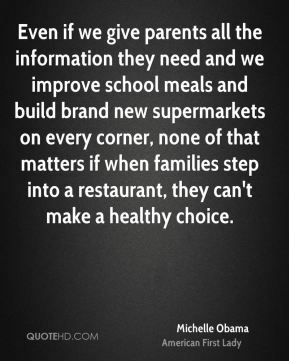 Even if we give parents all the information they need and we improve school meals and build brand new supermarkets on every corner, none of that matters if when families step into a restaurant, they can't make a healthy choice. 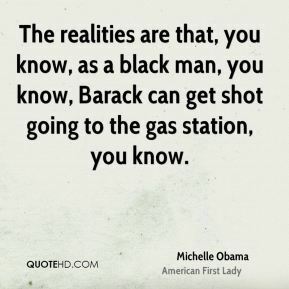 The realities are that, you know, as a black man, you know, Barack can get shot going to the gas station, you know. 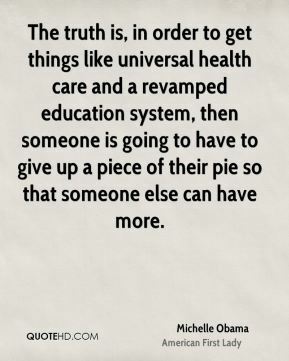 The truth is, in order to get things like universal health care and a revamped education system, then someone is going to have to give up a piece of their pie so that someone else can have more. 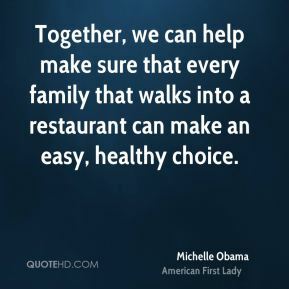 Together, we can help make sure that every family that walks into a restaurant can make an easy, healthy choice. 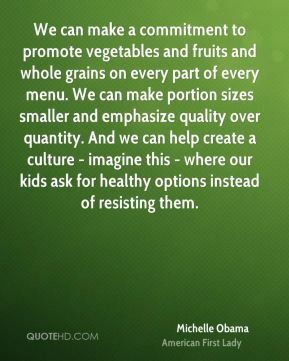 We all need to start making some changes to how our families eat. Now, everyone loves a good Sunday dinner. Me included. And there's nothing wrong with that. 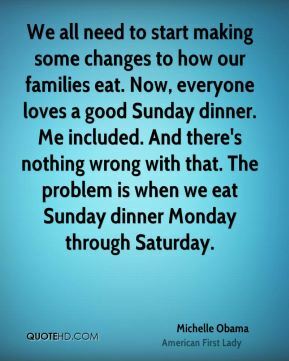 The problem is when we eat Sunday dinner Monday through Saturday. 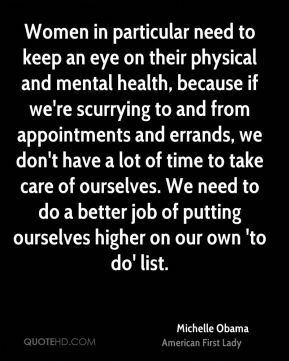 Women in particular need to keep an eye on their physical and mental health, because if we're scurrying to and from appointments and errands, we don't have a lot of time to take care of ourselves. We need to do a better job of putting ourselves higher on our own 'to do' list. Exercise is really important to me - it's therapeutic. 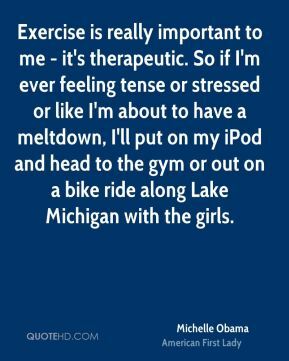 So if I'm ever feeling tense or stressed or like I'm about to have a meltdown, I'll put on my iPod and head to the gym or out on a bike ride along Lake Michigan with the girls. America is just downright mean. 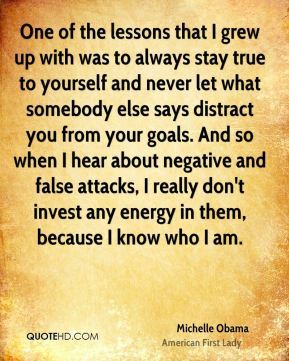 And in my own life, in my own small way, I've tried to give back to this country that has given me so much. 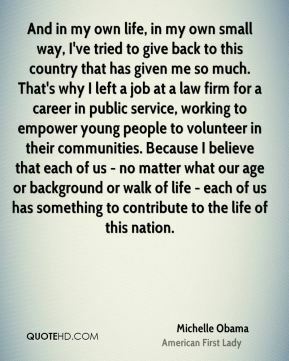 That's why I left a job at a law firm for a career in public service, working to empower young people to volunteer in their communities. Because I believe that each of us - no matter what our age or background or walk of life - each of us has something to contribute to the life of this nation. 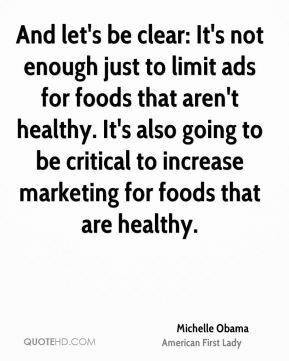 And let's be clear: It's not enough just to limit ads for foods that aren't healthy. It's also going to be critical to increase marketing for foods that are healthy. 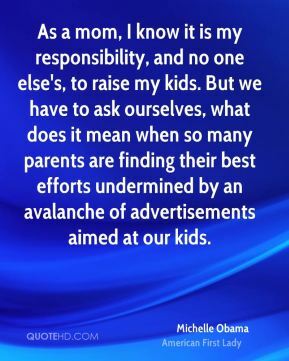 My first job in all honesty is going to continue to be mom-in-chief. 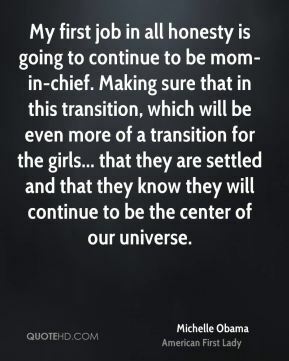 Making sure that in this transition, which will be even more of a transition for the girls... that they are settled and that they know they will continue to be the center of our universe.